Biryani masala powder is a blend of whole spices roasted and powdered. This spice blend not only adds the unique flavour but also lends the aroma that’s required for a perfect biryani. Skip the store bought stuff and make this easy biryani masala powder packed with tons of flavour and it’s so simple to make. A world renowned one pot rice dish biryani is a rice flavoured with exotic spices and cooked with marinated vegetables/ chicken/ lamb/ prawns. Making a perfect biryani is an art in itself. It takes time and requires a lot of practice but every bit of effort is worth. Meat/vegetables are first marinated in yogurt, herbs and this biryani spice mix. Rice and marinade are arranged in layers with final layer being topped with fried onions, mint, coriander, saffron infused milk, cooked on low flame with lid covered. This exotic biryani spice mix gives complex flavour to biryani. Due to an intense blend of spices, one can feel pronounced depth of flavours and aroma. 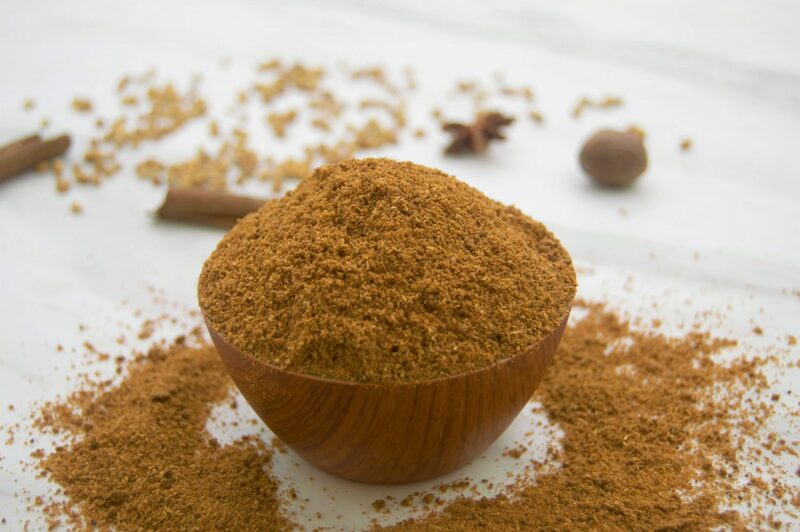 Each spice has its own aroma and adds its own character to this spice blend.Mace and nutmeg are most common spices in biryani masala powder recipe. Both lend delicate warm and sweet flavour. Cassia bark, cinnamon and cloves are the common spices used in not just biryani masala but most of the Indian spice blends. 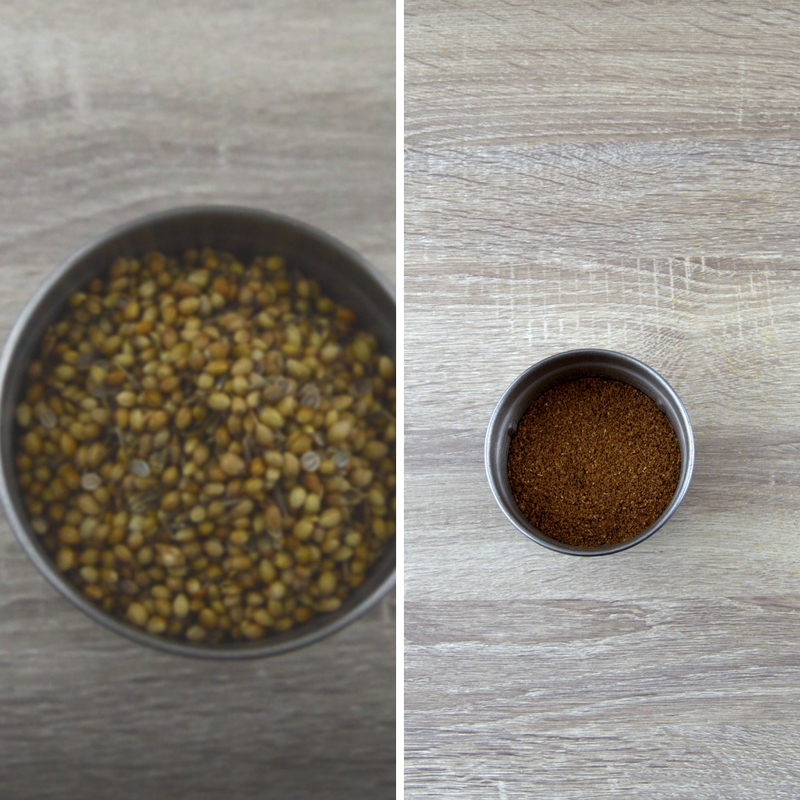 Whole coriander seeds has a slightly citrus flavour with the notes of sweetness. Dry roasting allows this spice to take on a more nutty and floral aroma as the oils release from the seeds. 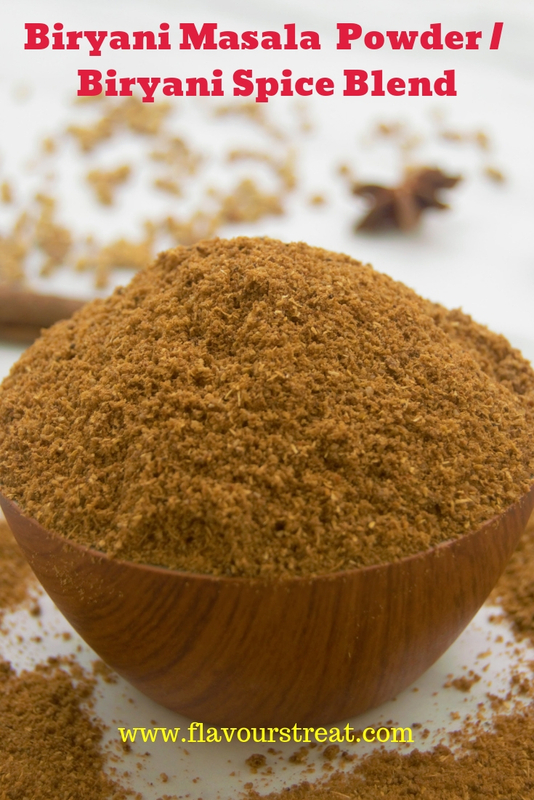 Cumin is not only an essential spice used for tadka, it is also used for many spice blends. Cumin lends earthy and spicy sweet flavour to the spice mixes. Crush nutmeg in a mortar-pestle. Dry roast coriander seeds and cumin on medium low heat for 2 minutes or until fragrant, transfer to a plate. In the same pan, roast cinnamon, cardamom, star anise, cloves, nutmeg, mace for a minute or until fragrant and transfer them to the plate. Finally dry roast poppy seeds for a minute and turn off the heat. 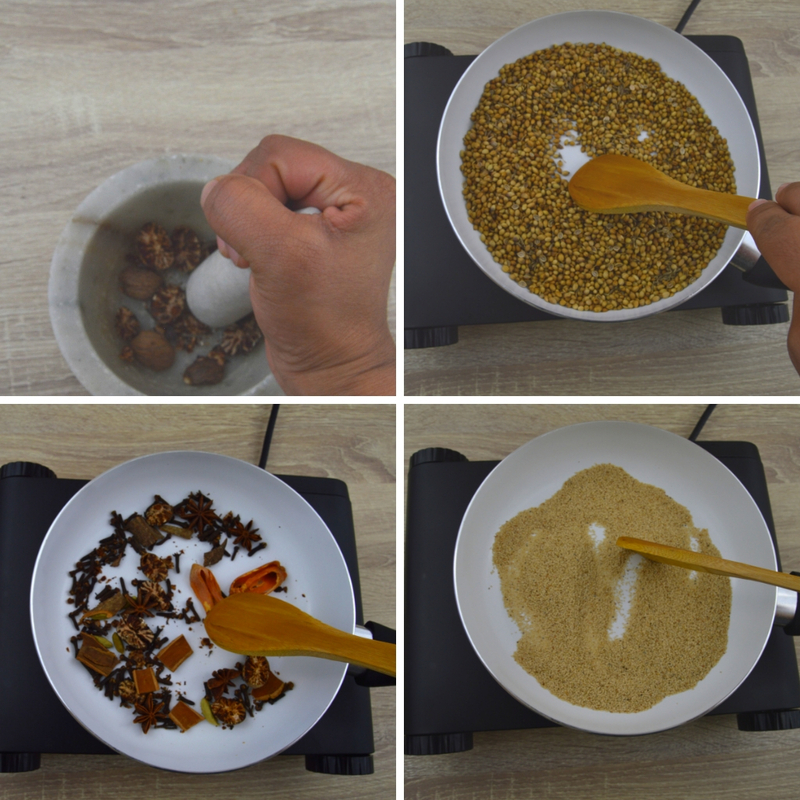 Allow the spices to cool down completely and grind them to a powder. Store in an sterilised air tight glass jar and use as required. Roast spices just until fragrant and ensure spices do not change the colour. Biryani masala powder remains fresh for 3 months, later it looses its aroma gradually. As I prepare biryani regularly I usually make big batch sufficient to last for nearly 3 months. If you do not intend to make biryani regularly I suggest you to make small batch of masala powder. 1 tsp is sufficient to make a biryani for 2-3 people. Add more if you prefer spicier biryani with intense flavour. If you like this spice blend recipe, you might also like other popular spice blend recipe like Chettinad Masala, Bisi bele bath powder, Sambar masala. Biryani masala powder is a blend of whole spices roasted and powdered. This spice blend not only adds the unique flavour but also lends the aroma that's required for a perfect biryani. Biryani masala powder remains fresh for 2 months, later it looses its aroma gradually. I would suggest to make masala in small batches. I am please to know you like this recipe. Homemade de powder are always best and we know what ingredients go in it. Biryani powder looks flavourful. Thanks for sharing. This is such an essential spice mix for us Indians. Powerful in flavour. Have never attempted to make one, will try soon. Plz do try and let me know how it turned out. What a lovely idea to make Biryani masala at home, you know exactly what gone into the recipe. It is handy to have this masala at home, making biryani will be a breeze. Lovely share. Plz do try and let me know how it turned out Swati. I hope you do try this recipe and let me know how you like it. Thank you. Homemade Biryani masala must be very flavourful and delicious . Loved your recipe and video too. lovely share .. Always use store bought biryani masala. Freshly ground homemade masala is always best. Sounds so aromatic. Superb share. very well said Vaniitha I totally agree with you. Nothing can beat a flavourful and aromatic rich homemade spices powders by urself.I love to make spice powders myself and this briyani masala powder looks incredible. Asolutely true!!! nothing can eat homemade spice blends. Glad you like this recipe. I’ve not used a special biryani masala for my biryanis.. just put spices together whenever I need to. This recipe is really nice, home made masala that I can store too and use whenever I need it. Glad you like this recipe Mayuri. Homemade biryani masala is a good idea. I always prefer to make as and when required. I am bookmarking this recipe. Thank you. Making ahead a small batch of these masala saves us lot of time .